Inder Loves Folk Art: Happy Birthday Helen!! My niece Helen turns four years old today! Isn't it amazing? Remember when she was brand new and Joe seemed ages and ages older than her? These kids grow up so fast! 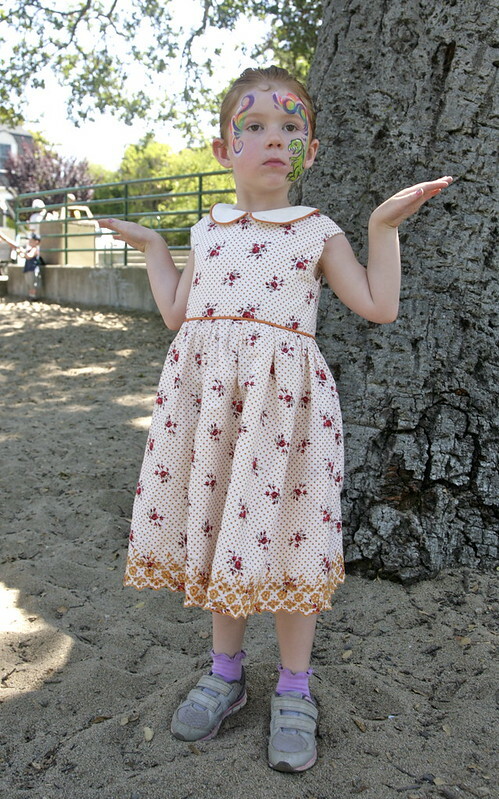 She had a birthday party this past Sunday, and I got a couple of pictures of her in her birthday dress. 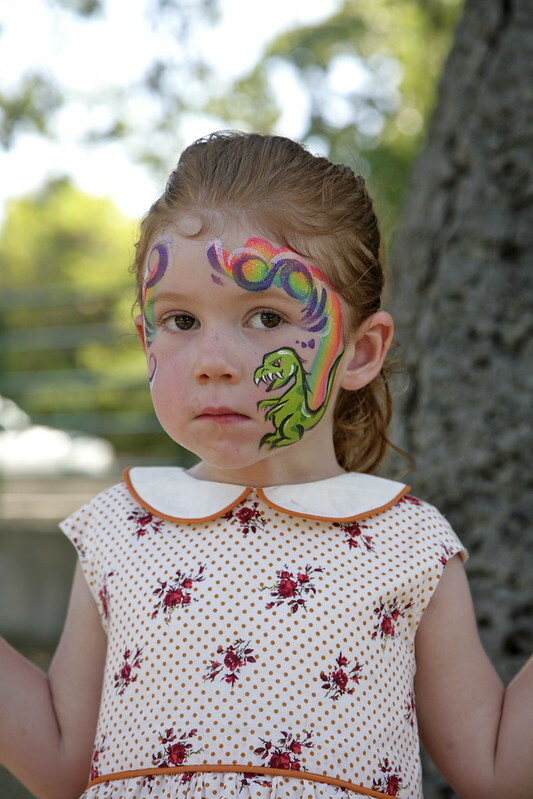 Helen had a rainbow dinosaur painted on her face, but she insisted on flapping her wings like a bird. Also, she mostly refused to smile (even though I assure you, she was having a great time at her party!). Hey, it's your birthday, kid, you can do whatever you want!! I was pleased to see that her dress fits just perfectly! I had taken her measurements before cutting, but I was still a little nervous. You know how that goes. Luckily for her, I think Helen is more outgoing and confident than I ever was! 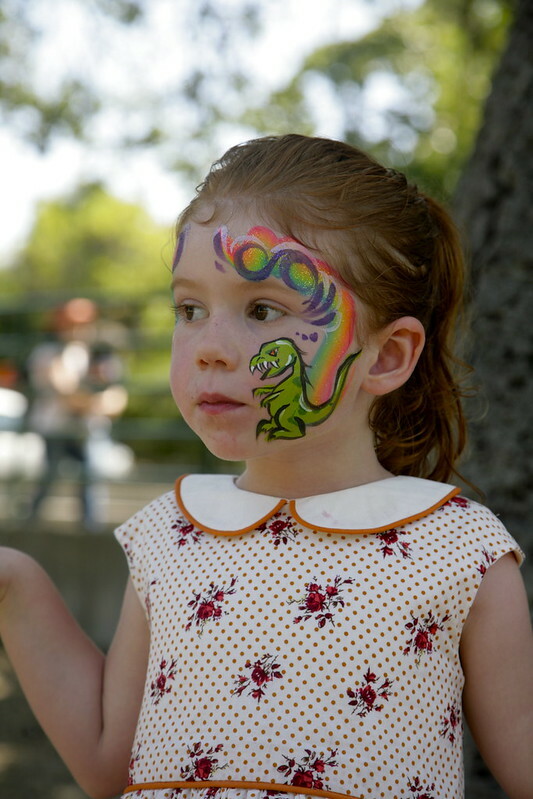 And she obviously has great taste - I'm not sure I would have come up with the idea of a rainbow dinosaur! Like I said, she refused to smile for me, preferring instead to give me her grim game face while flapping her wings. This bird clearly means business! I think she was the type of bird that strikes fear in the hearts of rodents. This girl cracks me up! Happy birthday Helen-Melon! I love you sweetie! What a cutie- even without any smiles. And that piping is absolutely perfect, especially with her hair color! Just lovely. Yes!! It is not every girl who can pull off orange, but Helen really can! So cute, Inder. I love it. I love your description of Helen, too. And her shoe choice is what my girls try to do, too. Except they always choose Keens. I think it's the quintessential homeschool uniform. :) Smiles or no smiles, she is adorable! Thank you Rachel! Yes, I approve of her practical footwear (I'm sure she'll have opportunities to wear the dress with fancy shoes too, but for a party in the park, you need good playing shoes!). I wish she had been more cooperative with photos but it was either this or some kind of very false "photo smile" face she was making - clearly she was not in the mood for photos! But she did have a great time and loved the dress. Well, her party was at the park, and a girl needs good playing shoes for that! Just as I suspected - the dress looks amazing on her! 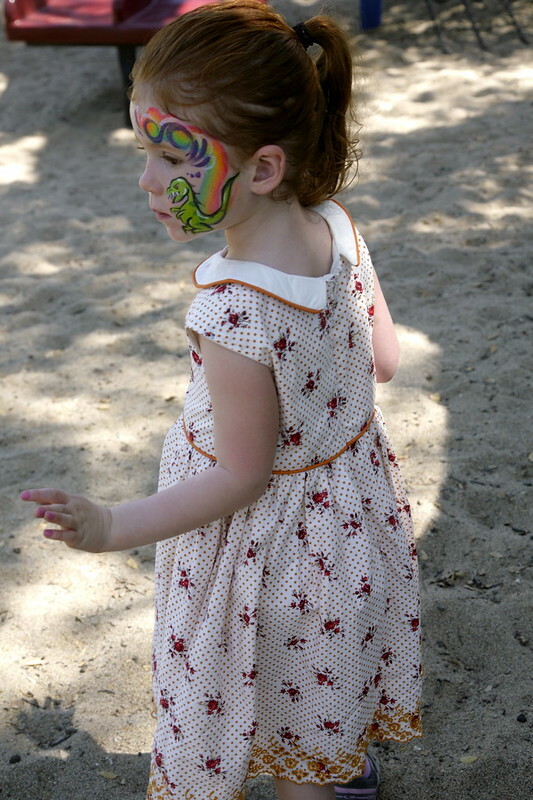 And that dinosaur butterfly tatoo is all pretty amazing! Thank you, Carolyn! 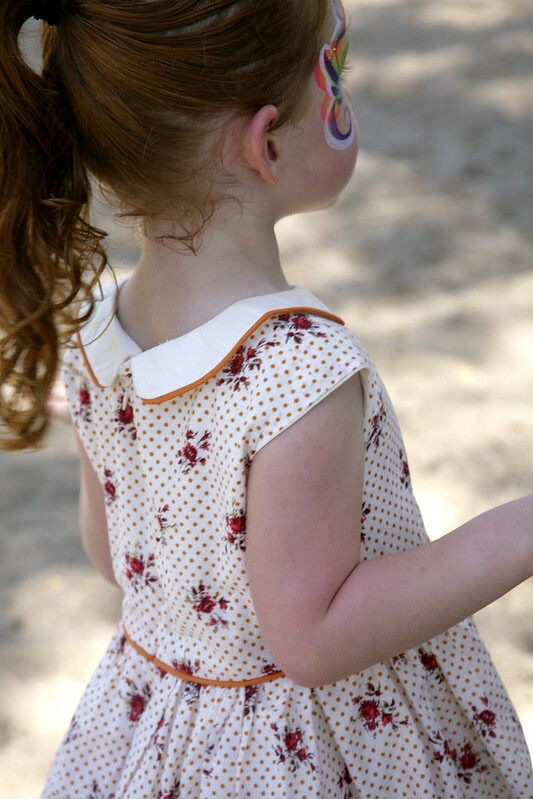 It was so fun to sew, and such a treat to make a dress for a little girl who loves to wear auntie-mades! I would take it as the ultimate compliment from a girl who clearly knows her own mind that she is happily wearing that beautiful birthday dress. Do you know the song 'Happy Birthday Helen' by Australian band Things of Stone & Wood? Your post title has put it into my head. I don't know the song! Now I must go look it up! You can tell just by looking at her that she's awesome. Plus, she looks beautiful in that dress. She is!!! And thank you. I think she really likes the dress too!